THE newly appointed Police commissioner is being investigated according to police. Peter Aoranisaka was announced the new police commissioner on Friday night by Prime Minister Gordon Darcy Lilo after a day-long bitter argument in cabinet over a choice. On Saturday night, there was a perilous accident at Town Ground involving the unofficially appointed police commissioner. Police have been declining since Sunday, to confirm the involvement of Mr Aoranisaka, although eye-witnesses confirmed the newly appointed commissioner cheated death in the accident. A hospital worker yesterday told the Solomon Star Mr Aoranisaka was taken to hospital early Saturday morning. When contacted to find out whether there will be investigations, the police media unit responded with a media statement that still withhold the name. “The RSIPF Traffic department has conducted an investigation into a senior officer, who was believed to be involved in a motor collision over the weekend,” the police media statement said. The statement further stated “Police want to inform members of the public that one of its senior officers who was unfortunate to crash his vehicle on a brick flower pot along the Town ground area on Sunday night, is pending a police investigation matter”. Police also could not confirm whether alcohol was involved but initial reports claim Mr Aoranisaka was celebrating news of his appointment the day after the Prime Minister’s office issued a statement to the media after cabinet gave an all clear for him to take up the post on Friday night. Mr Aoranisaka was third on the recommended list of five by the Police and Correctional Service Commission. Those familiar with the recommendation said number one on the list was Englishman, Frank Short followed by Edmund Sikua, Mr Aoranisaka on third and former acting commissioner Walter Kola fourth. The police media unit yesterday said the senior officer involved in the accident was returning home alone when the incident occurred. “The officer is in good health and is well at home,” the police statement said. Meanwhile Malaita Ma’asina Forum (MMF) president Charles Dausabea urges the Prime Minister and cabinet to rescind the appointment of Peter Aoranisaka. “The incident involving the appointed police commissioner if true is a clear manifestation of yet another unwise decision. “Why did the Prime Minister and Cabinet ignore the top and recommended candidate Mr Frank Short? Mr Dausabea questioned. A Cabinet Minister spoken to on Monday Mr Commins Mewa said Short was disqualified by the Cabinet on grounds that his age exceeds the retirement required age of 55. 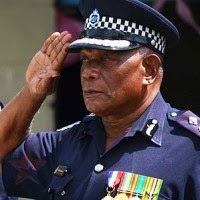 Mr Dausabea said the incident must be thoroughly investigated, but emphasized that the decision must be rescinded and refer the matter back to the Police and Prison Service commission.